"One of the saucers mentioned in the press!" thought a witness when the phenomenon appeared before him. The phenomenon's arrival in the Spain occurred a month later, in July 1947, when two news items were reported by the Spanish press. 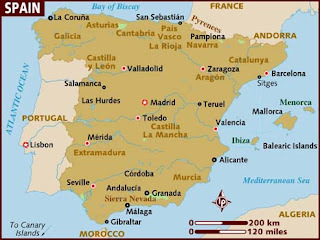 The first of these was in the locality of Balazonte (Albacete) and the second in Azpeitia (Guipuzcoa). The accounts state that several farmers working their fields witnessed a dark object fly noiselessly and slowly over their heads, being similar to a "derby hat". The sighting occurred at 19:00 hours. 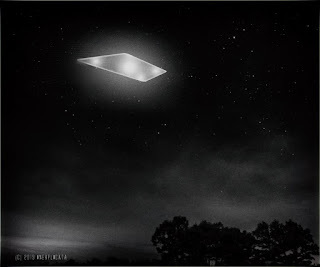 The mysterious object was seen in various localities of the province of Albacete, with all descriptions of it in agreement: an object that did not glow at all presented the stereotypical shape of a UFO. 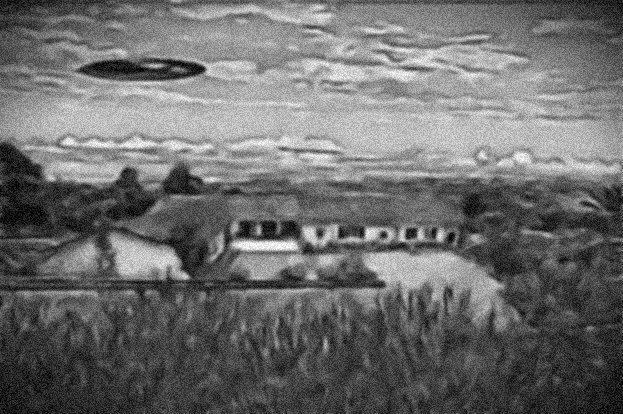 On July 15, 1947 the second sighting in the Spanish peninsula took place in Azpeitia (Guipuzcoa). On this occasion, there were six witnesses to the strange object that passed before them. It was very bright and left a wake in its path. The mysterious object appeared about to land on a nearby hillside, but immediately rose into the air. 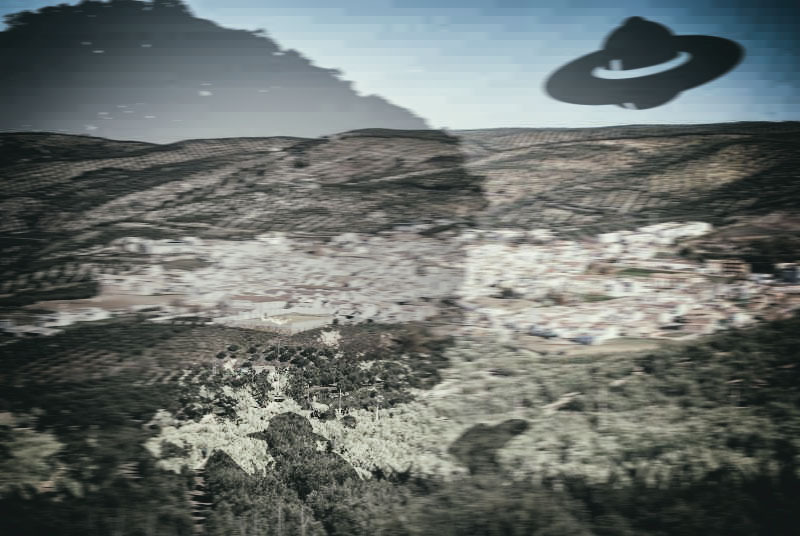 The object was dubbed the "Azpeitia Saucer", and as it rose into the air, it issued flashes of light "that caused all surrounding valleys to light up as if it were broad daylight." The object was also seen in other localities of the Basque Country, such as Fuenterrabía. There was a growing number of witnesses whose testimony accrued around the incipient 20th century phenomenon. One of the first close encounters with an unidentified flying object in Spain took place in Seville. In July 1947, around 18:00, young José Villalobos Cuadra was suffering through the punishing Andalusian summer. He was an ordinary fellow, a medical student heading toward an olive grove in Montequinto - a district near Seville - that evening. José Villalobos used to go that location to find the peace and tranquility his studies required. But something unforeseen occurred that evening - something the young man would never be able to forget: the UFO phenomenon was about to materialize before him. His eyes were on the book before him when something caught his attention. Raising his head slowly, he found a strange object before him, separated by the road that leads to Utrera. It resembled a metal sphere surrounded by a ring, flying around the olive trees of that grove while issuing an annoying buzzing sound. Villalobos stated that the distance separating him from the object was some 300 meters (984 ft.). The object ascended in a rotating motion "much like a corkscrew" and then vanished toward the southeast. Like a good, steely-nerved medical student, the young man said: "After looking at it, I resumed my studies, telling myself: "It's one of the saucers mentioned in the press!" and returned to my business. Unknowingly, he went on to form part of our country's ufological history. Daniel Vidal, General Secretary of the Municipal Workers and Employees Union (Sindicato de Obreros y Empleados Municipales de Puerto Deseado), claims having seen an unidentified flying object (UFO). "It was large, rectangular and full of lights, like those of a spotlight. I saw it in the early morning hours of Tuesday in Comodoro Rivadavia, around 3:30 a.m." he said. "I pulled over, got out of the car, and got closer for a better look. It made no sound whatsoever. I'm surprised that I didn't think to take a photo of it or record it." The labor unionist noted that the event "lasted several minuted and [the object] remained suspended in mid-air, at low altitude, and also in motion." Spain: Two New UFOs Recorded at La Rioja's "ET Base"
It was only a few weeks ago that the paranormal world was rocked by images recorded by a drone at La Rioja. An unidentified flying object suddenly appeared on the scene, and theories concerning its nature spread like wildfire. 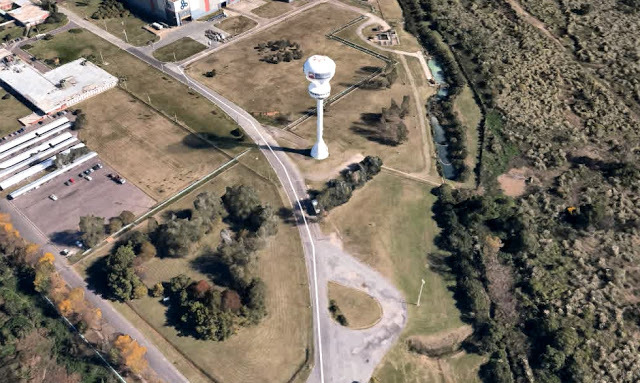 To the "Verdad Oculta" (Hidden Truth) channel on YouTube, with nearly 700,000 subscribers, there was only one possible answer: There was an extraterrestrial base in the vicinity of Ribafrecha. Too shocking, too questionable - it was necessary to secure more evidence to confirm this. So Nacho Rojo has recently visited the scene of the events in the company of the authors of the original recording to conduct some on-site investigation. To accomplish this, he and his companions equipped themselves with two infrared cameras just in case something happened. And it did happen. 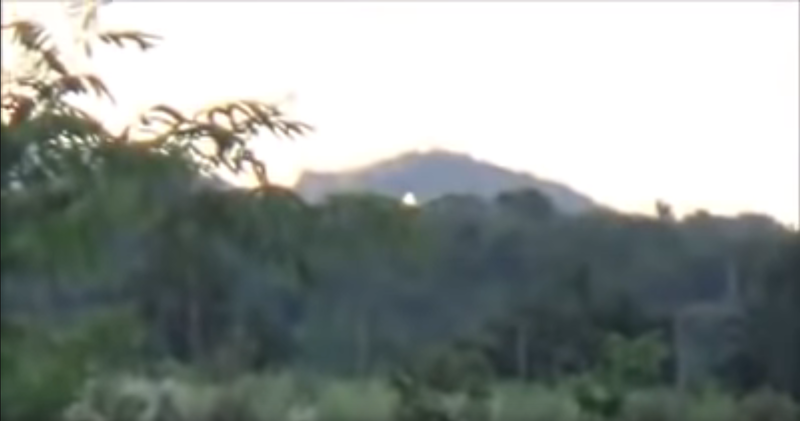 Beyond "La Grieta" (the Crack) - a vast cavern open flat on the ground - from which the UFO allegedly took off in late January (2019) the most interesting feature of the recording takes place at nightfall. The time was 19:15 hours when the infrared cameras captured "something no one was prepared to see. We couldn't believe it. Not just one UFO, but two, and they crossed each other’s path in the sky." Thus, two points of light engage in constant movement in a sky filled with stars. "These are anomalies that shine like stars in a linear travel path, but they are not airplanes," concludes the researchers, adding that "this is the first video-program of all the material we have, and believe me, the best is still to come." In his sign-off, Nacho Rojo states that "many have questioned the veracity of the recordings and many believe there is no extraterrestrial base. Our research points out the truly extraordinary nature of that place." 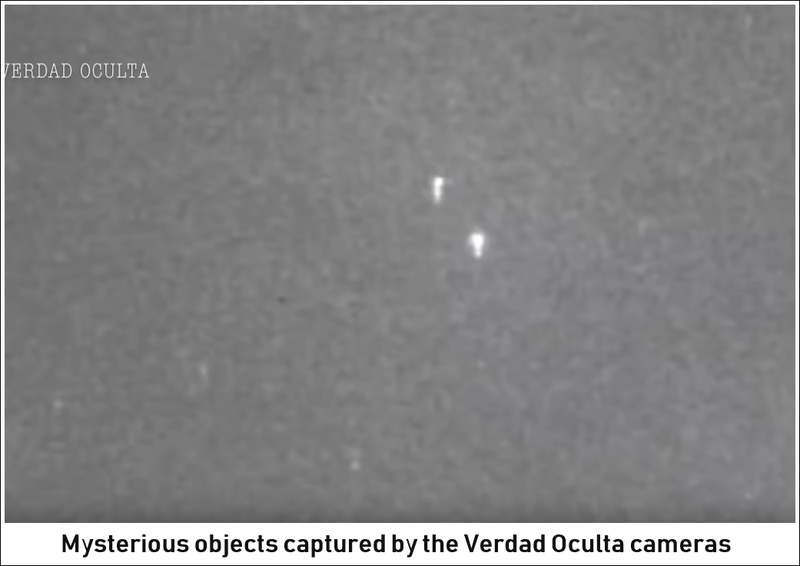 On his Cuarto Milenio television program, researcher Iker Jimenez brought to mind the episode of the "Boy of Tordesillas", which occurred in October 1977, when a youngster witnessed how a beam of light, issuing from an unidentified object, pierced his chest. This resulted in numerous neurological surgeries - between fourteen and sixteen - according to the show host. It was an action-reaction, as is often said. Last Sunday, Venancio Alvarez described his UFO sighting in the municipality of Castronuño in Valladolid. 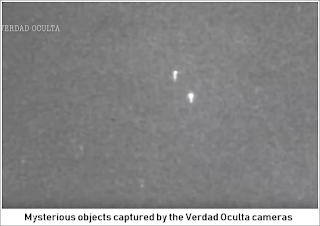 "We could see the object as far away as Tordesillas," he said. At that moment, Iker Jimenez, host of Cuarto Milenio, exclaimed: "Do you know what happened to a child from Tordesillas?" he asked Venancio. "Your mentioning Tordesillas has made my hair stand on end." 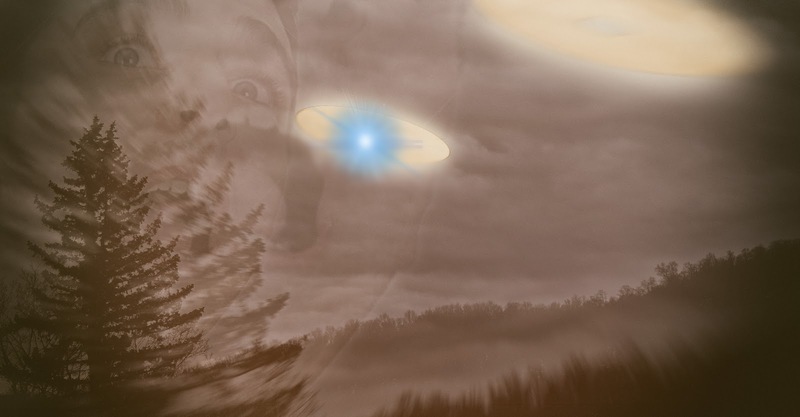 Jimenez recalled a close encounter incident that he had uncovered - "The Boy of Tordesillas" - an episode in which an object with a porthole rose out of the fog, firing a beam of light that struck one Martin Rodriguez Rodriguez between the stomach and the chest, an incident that has gone down in the annals of ufology. "When I received Martín's medical report, I realized that his life had become a living hell. He underwent between fourteen and sixteen life-or-death brain surgeries in which his cerebral fluid was drained, all of this due to this apparition." Jimenez mentioned the time that Martin had visited his program in 2006 - an episode which aired a year ago today, February 12, 2018. "Martin was left for dead. When he regained consciousness, he made a drawing and scribbled, 'I've seen a UFO'," added Jimenez. Last year's show also featured Daniel Pérez, who had also been the protagonist of a classic 1970s UFO case. This man had also witnessed a light - with occupants - over the same community in Valladolid. Daniel told his story, adding that he "threw a rock" at the luminous object, which suddenly went dark. "Three or four seconds later, the outline of a door appeared, making it possible to see "a head and a cucumber-shaped body" although it wasn't entirely possible to say that it had arms or legs." Daniel says he "tried to communicate" with the presence. Just another interesting UFO case presented by Iker Jimenez on Cuarto Milenio. 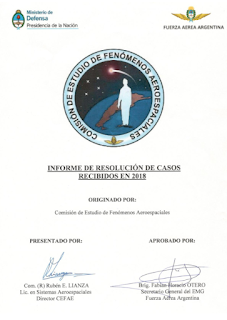 The Comisión de Estudio de Fenómenos Aeroespaciales (Aerospace Phenomena Study Commission, or CEFAE) has released an 80-page report covering their analysis of UFO photographs for the year 2018, effectively dismissing twenty-two (22) covering the past five years. 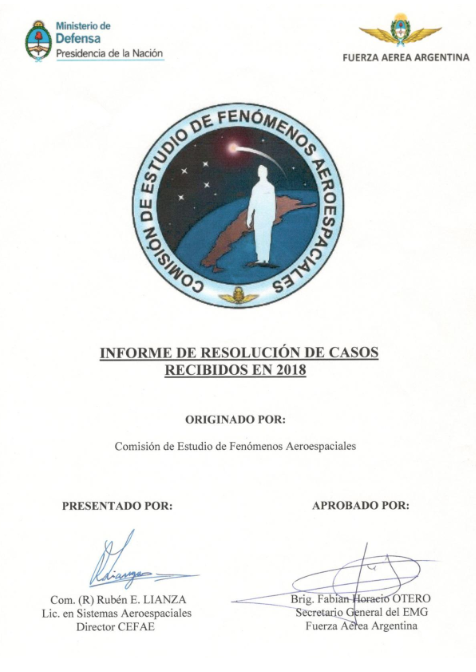 The report also includes a stunning rejection of the landmark Caso Bariloche (The Bariloche Incident of 1995) in which an airliner was supposedly harassed by a UFO that caused a total blackout in the city of Bariloche. 11) CASO DIEGO CRESPO – Campana; Pcia. de Bs. As. 12) CASO PAOLA CARCO - Capilla del Monte, Pcia. de Cba. Birds or insects flying in front of the camera (with no rod effect): 9 cases. "As evidenced, the biological causes (birds or insects) were predominant because whenever people take photos of a landscape in general without having seen any flying object that caught their attention beforehand, and moreover, when someone intentionally takes photos of the sky "to see if something shows up", the likelihood of a bird or insect crossing the camera's path is very high, reducing the photograph's strangeness index to zero, unless one chooses to believe that there are hundreds of UFOs that are "only visible to the camera" by virtue of being in "another frequency" (as some "researchers" blithely sustain without providing any specific elements to support such a statement). In fact, the birds and insects were not in any "alternate frequency" separate from our natural world. Due to this equality of conditions (Occam's Razor), birds or insects will always constitute a solid basis for solving the case, especially when their wings and other biological traits stand out during an enlarged inspection of the object. For this reason we ask our recurring witnesses who take pictures of the sky "to see if something shows up" to please restrict themselves to sending photos or videos of objects that have caught their attention before deciding to photograph them. Thank you for visiting our page. Cmdr. (Ret.) Rubén Lianza, Director CEFAE. IPACO software was employed in conducting the analysis and mention is made throughout the document of the use of "Occam's Razor" as the main investigative approach. 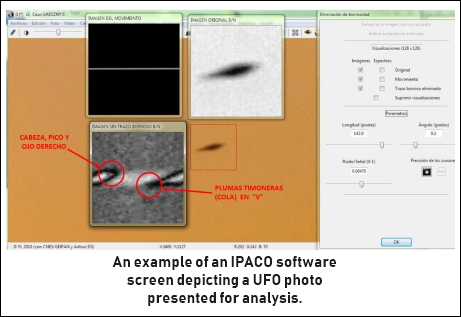 IPACO was developed in 2008 with monetary support from CNES, the French space agency, as part of the investigative operations of GEPAN - now GEIPAN - aimed at investigating anomalous phenomena. The 1995 case is explained away as "a reflection of the floodlight being operated from the Rocket Discotheque" adding that a witness - Sergio Segade - had confirmed the path followed by this klieg light. "It can be deduced that the same luminous stimulus seen by Segade coincides with the main UFO seen by all other witnesses. No evidence was found that could refute the possibility of considering one of the platform's lighting towers as the likeliest cause of the 'flash' seen, owing to an overvoltage prior to the general blackout" that plunged Bariloche into darkness. "Why am I feeling unwell? Because I have now ascertained that everything we have researched about this subject is true. And it is very, very heavy." Within the phenomenology of strictly physical humanoid encounters we find two types of close encounters: Related entities, with a UFO sighting, and Unrelated entities, in which no object whatsoever is readily visible. It is obvious that the first are the juiciest for research and analysis, but even so, records of strange characters appearing before the eyes of startled witnesses have been - and remain - very interesting when it comes to their evaluation. It just so happens that with no vehicle in evidence, a variety of interpretations can play a trick on researchers: Was the protagonist really face to face with an alien being, a Marian apparition, a ghost or merely a prankster? Moreover, the chances of a hallucination, or mistaken identification of a human, cannot be overlooked when it comes to unraveling the case. As we shall see below, our Humanoid Database, consisting of 500 Argentinean reports from 1947 to the present, contains very enticing events that involve these mysterious nocturnal intruders. 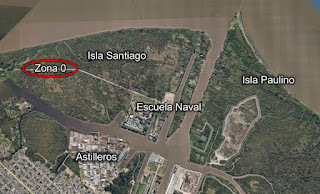 The case in question took place on Isla Santiago, accessed by the witnesses from La Plata to Ensenada and then along Almirante Brown Avenue, which leads to the Punta Lara bathing resort. These are natural wetlands that makes up the delta which bears the same name, separated from Isla Paulinho in the canton of Berisso by a 200 meter-wide channel. 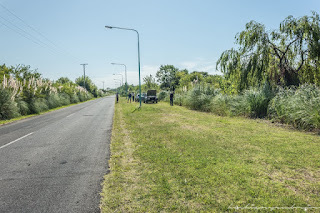 A few kilometers of paved road lead to a bridge whose canal connects the Rio de la Plata with the Club Regatas La Plata, and we come to what can be termed AREA ZERO, that is to say, the epicenter of the close encounter. There is a small channel that covers some 700 meters and empties into the river, and this is perhaps the exact location where the anthropomorphic figure became lost during the night of the eclipse. The marginal jungle covers both sides of [the channel]. An inhospitable area with abundant water and lush vegetation. Power lines and light posts follow the track to the Escuela Naval Militar, founded in 1872 by President Domingo Sarmiento, but reinstated in its current location in 1943. 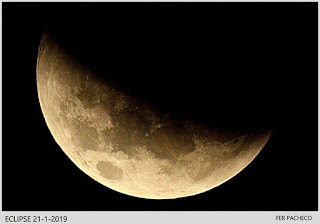 Sunday, January 20 - the night of the famous eclipse - was clear, starry and with a slight wind that did not trouble at all the thousands upon thousands of anxious spectators of "the blood moon". The family headed to the Escuela Militar Naval's docks, as it had done on other occasions, located in the heart of Isla Santiago. The clock showed 21:15 hours. Mates, snacks, clean air and conversation were on hand to bring about the moment of the eclipse. But around midnight, the youngest girl felt cold and they decided to leave and finish seeing the concealed moon from their own home in La Plata. With Cristian at the wheel, his wife beside him and the three others behind, they set off their return journey. Only minutes later, driving along the straight paved road, Cristian noted something strange in the distance: a tall silhouette whose height he estimated at some two meters, standing on the left hand side of the road, lit in the distance by the vehicle's headlights. It gave the impression of standing with its back to the road. Startled, he slowed down and cut his high beams to get a better look at the sight. And that's when he realized that the character crossed the road normally and vanished into the foliage bordering the road. Meters ahead, passing through the location where the being supposedly concealed itself, he saw nothing unusual and continued his trip, as his wife was unwilling to stop. The five members of the family were able to see the figure in question to a greater or lesser extent, given its speed and their visual perspective from within the car. During the on-site reconstruction of the events, we placed the maximum proximity between the visitor and Cristian at some 40-50 meters at the moment that it crossed the road. The scant visibility of the area - since a few sodium lights happened to be off - added to the fact that Cristian lowered his high beams, did not allow an abundance of details on the entity. Even so, we estimate that its height was no less than two meters, slender in shape, and wearing a grey, non-luminous uniform. The area of the head was "darker" than the rest of the body, and as an interesting fact, its arms were outstretched and somewhat tilted forward alongside its torso. The time was exactly 0020 hours on Monday, January 21. Over the course of several decades we have quantified and researched a considerable number of these entities along highways and roads. Aloof and not prone to causing encounters, their attitude is one of avoidance or indifference toward witnesses. But there are three significant details: their appearance during hours of the night, their light clothing (white or grey) and their classification (Type 3, tall beings). Similar events are abundant, but there is an area where they have proliferated over the course of decades: The southern regions of Santa Fe province. This area of the Buenos Aires riverside has produced extremely interesting episodes related to the UFO phenomenon, particularly from fishermen, who constitute the 'elite core of UFO reports' along with hunters, rural dwellers and car drivers. On March 19, 1974 at dusk, Mrs. Encarnacion del Valle Guerrero advised us that she had seen - from her dwelling in the vicinity of the former Propulsora Siderurgica (now SIDERAR) factory, an enigmatic and overwhelmingly tall luminous silhouette clad in sky blue, "floating" alongside the tower known as La Cebolla (the Onion), located 3000 meters in a straight line from the case that concerns us here. Olga Ch., who currently lives in Spain, told us: "One morning in 1978, at around 03:00 hours were partying at a disco that used to be at Punta Lara and called "Tio Marcelo" (very famous in its day). Three couples stepped out for fresh air and we sat on a coastal wall looking at the river. All was quiet. Suddenly, we saw a flying saucer emerging from the water, fully illuminated, making a loud noise. The night turned to day and it was possible to make out the ships waiting their turn to enter the anchorage. Water streamed off its lower section back into the river. It hung in the air for some seconds, becoming either smaller or reducing its luminosity, and it took off swiftly toward the nearby summit of Boca Cerrada. It scared us - me most of all, since it made my eyes hurt, perhaps from the brightness of its light. The image would pop up in my mind for several months. I'll never forget it..."
One warm evening in 2007, Arturo F. was fishing around one o'clock in the morning in a sector of Arroyo Largo, a few hundred meters distant from where Cristian had his encounter. He witnessed an unusual event in the river. For about an hour, there was a show of 'five luminous objects' plunging into and emerging from the water, repeating this behavior several times throughout the duration of the sighting. When it comes to evaluations, these cases of Unrelated Entities contain not only the absence of a flying object but also the lack of conclusive proof. Is this a negative factor? Yes, without a doubt, but only if we adhere to this posture, then over 80% of the Argentinean case histories of the 1940s, 1950s,1960s etc. would crumble due to a lack of proof. Therefore, eyewitnesses remain the foundation of all research. Many of them are fully reliable, others less so, and others are unreliable. It would be better if probative elements could be attached to the story, obviously, but when these are absent, we are left with the ufologist's acumen in defining a case as POSITIVE, NEGATIVE or QUESTIONABLE. Examples of this are the three 'credible' classic cases of national ufology, in which the evidence is the least evident item. July 20, 1965, 0830 hours. A cloudy, drizzly morning in Greater Buenos Aires. At that time, Ramon Pereyra, 38, was delivering merchandise in the Villa La Florida area in the locality of San Francisco Solano, some 18 kilometers from Capital Federal. Suddenly, he noticed that a sort of "luminous parachute" was dropping from the sky. This caught his attention and he decided to go and meet it. He walked a few hundred meters, crossed the General Belgrano train tracks, a stream, and entered into the well-known Monte de los Curas, where a monastery operated in years past. He realized that what had dropped from above wasn't a parachute: There was an oval-shaped object on the ground with a transparent dome, containing an individual wearing grey coveralls and hood. There was another character standing thirty meters away, wearing similar clothing but with the hood pushed back, making it possible to make out its features. It had short blond hair, stood 1.80 meters tall, and carried large binoculars slung around its neck, a holster around its right leg and a belt with a silver buckle. Its footwear resembled leather boots. A completely "normal" person. Upon noticing Pereyra's presence, the intruder immediately ran toward the craft, crossing the human's path and nearly bumping into him. Pereyra asked, "Is there something wrong?" The craft began to rise and vanished into the sky. While there was involvement by the local police, no traces whatsoever were found of the landing, or any anomaly that could be linked to the story of Ramon Pereyra, who never tired of saying that what he had seen was "a Russian". June 14, 1968, one o'clock in the morning. Maria Elodia Pretzel, 19, said farewell to some guests of the "La Cuesta" motel located on Route no.20 and two kilometers away from the center of Villa Carlos Paz (Cordoba). Her father, Pedro Jacobo Pretzel, the landlord, had not yet returned. The young woman, thinking that someone had turned on the lights to the common room, went inside only to find a startling visitor: a being standing over two meters tall, clad in form-fitting tights of a fluorescent blue color and bearing a luminous orb in its left hand, only a few meters away from her. There was a large ring on its right hand, resembling a gauntlet. When the creature raised it, Maria Elodia felt herself become weak and dizzy, and when the object was lowered, she regained her senses once more. The intruder, whose demeanor was otherwise friendly, vanished from the room minutes later. Her father arrived shortly after and found her unconscious and in bed. At a given time, the witness heard the phrase: "Do not be afraid" in her head. Doctor Hugo Vaggione, 33, the family's private physician, diagnosed the young woman with a nervous condition perhaps arising from shock. As a positive contribution to the case, we have a re-investigation of the incident by Daniel Lopez (FAO Baires) 20 years later, with María Elodia reliving the situation as if it had only transpired the previous evening. November 17, 1969, evening. 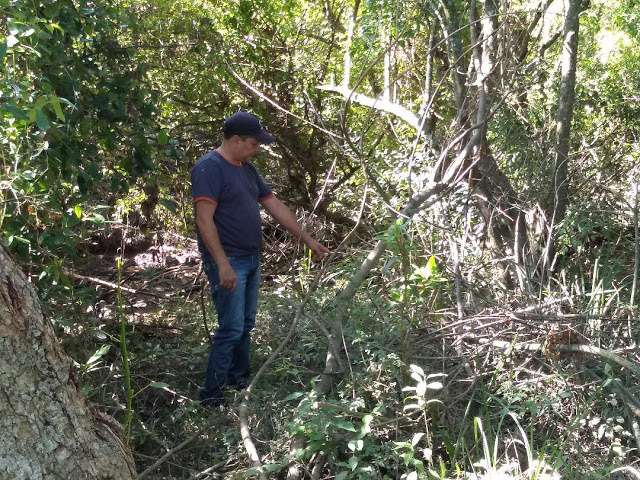 Aquilino Ramon Acosta, 44, responsible for the "Mi Recuerdo" farm, located in Crotto, near Olavarría (Buenos Aires), awoke suddenly when he became aware of strange activity on the farm. In the darkness, he was able to make out seventeen figures moving among the trees, lighting the ground with flashlight-like objects that fired beams of light, as if 'searching for something'. But what he found most striking was their red, transparent legs. For moments they appeared to be levitating. The only evidence presented by Accosta was 'some eye trouble." 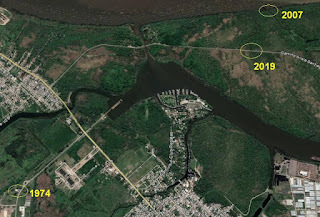 The phenomenon's penchant for penetrating scientific and military installations reappears in this case with the presence of the Escuela Naval Militar in the vicinity of the encounter. But without question, beyond the power lines and the wilderness, water emerges as the most attractive factor. UFOs and their occupants are often seen in the vicinity of water areas, no matter how small, even when they have a river or the sea at their disposal. Watering holes, streams, water troughs, swimming pools, lagoons, etc. For example, in the Ensenada - Berriso region, toward the late 90s, there was an Unrelated Entities case I dubbed "The Little Nuns of Berisso". Short, clad in dark garments like tunics and with their heads covered, they appeared for over a week in Berisso's SUPE district and in the area known as El Puente Roma, where a canal just happens to cross the area bordering with the YPF refinery and emptying into the Rio de la Plata. These diminutive humanoids also made an appearance at the old, abandoned Puerto La Plata Hydraulic Station. Fishermen: While the small channel emptying into the river is not the region's best feature for fishing, some make regular use of this little stream and in fact, once deep into the wilderness, we found trails between the foliage and items of clothing. Therefore, someone sleeps or transits through the area. Would it be very strange to 'mistake' a nocturnal fisherman with the unusual entity described by Cristian and his family? While the scale would tip toward the affirmative, it would not be 100% conclusive. Jokers: This is perhaps the least sustainable hypothesis given the lack of eyewitness accounts involving sightings of this type. Was it someone in disguise on the night of the eclipse, aiming to scare or mock casual witnesses driving past in cars? Thieves: It is interesting to suppose that a person would aim to waylay drivers in order to rob them. But the character in question had no intentions of stopping the vehicle, but rather quite the opposite - he FLED and/or HID in the dense vegetation lining the road. Hallucination: A perception that bears no relation to any type of external stimulus. A very feasible hypothesis, but it loses strength as a COLLECTIVE sighting involving three adults and two minors. The baby's reaction plays a fundamental part in this, being the fifth witness at the time of the sighting. She exclaimed: "Oh, I'm scared," and covered part of her face with a hand. Finally, we must make clear that neither Cristian nor his wife consume alcoholic beverages or show signs of addiction. 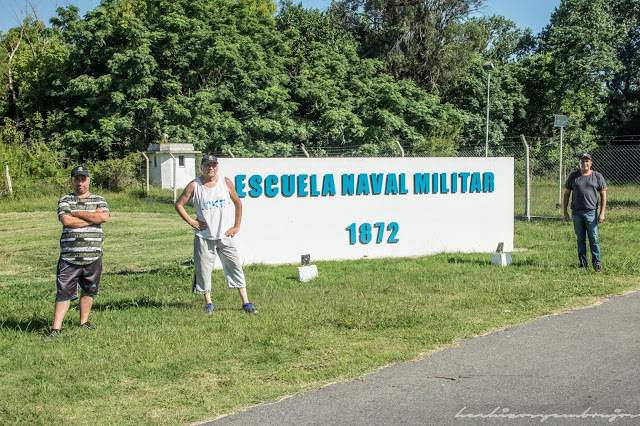 Tactical Frogmen: Probably during the days of the dictatorship or in facing the likelihood of a war (against Chile or Great Britain), these commandos of the Argentinean Navy would have been a logical explanation to the entity observed by Cristian and his family. Moreover, this is bolstered by the proximity of the Escuela Naval Militar and the delta's ideal geography as a training site. But at the present time, this suspicion vanishes almost entirely. Fraud: Setting the confusion factor aside (Did Cristian and his family witness an alien presence at Monte Santiago?) perhaps we will never know. It is up to the reader to believe or disbelieve their story. The exception that can be made in such cases leads us back to the statistics on national UFO witnesses, and out of the thousands in their ranks from 1947 to the present, only a fistful has emerged as collective frauds, that is to say, "an association of people who commits fraud with a purpose in mind - a prank, publicity,etc." The majority of these fraudulent ufological cases have been committed by individuals or by couples, at most. 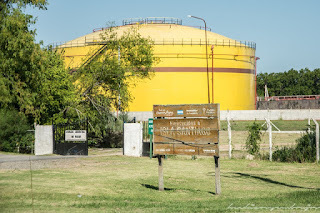 Extraterrestrial Entities: While there are notable coincidences between this case and others involving Solitary Entities in Argentina, the absence of specific proof makes this possibility take a few steps back. But our research did shed some light on this controversial case. 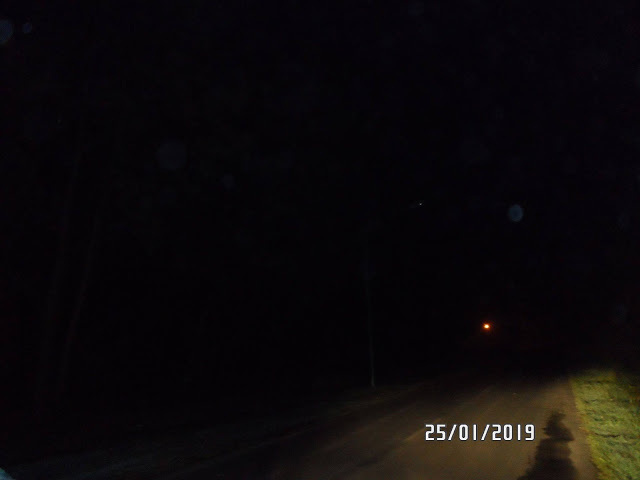 A highly reliable narrative says that on Tuesday January 22 at 23:30 Hours (at least 48 hours from Cristian's incident), a couple driving in their car along the same road was startled to see a bizarre silhouette with glowing green eyes between the vegetation. Could this have been the same figure that appeared before Cristian? 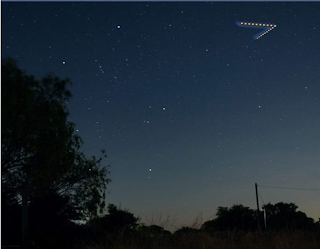 The appearance that same evening of a strange light in the sky that had nothing to do with the transit of the ISS, Iridium or other satellites, no doubt bolsters the hypothesis that something anomalous happened between the sky and the land of Isla Santiago. At 00:20 hours on Monday the 21st, the 'close encounter of the 3rd kind' involving Cristian and his family took place, in other words, one hour and fifty minutes later. 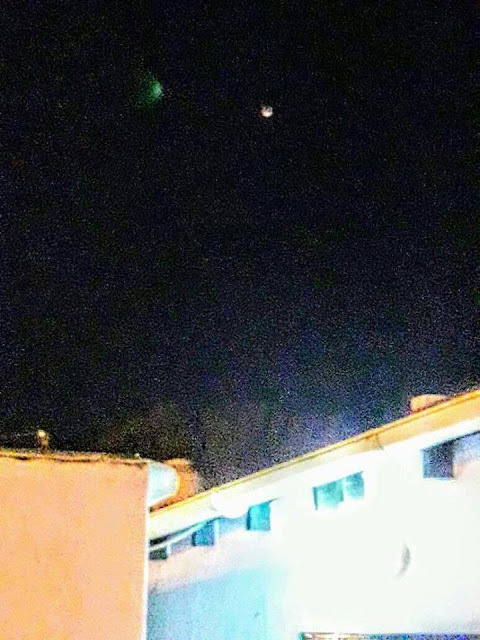 At 02:01 on Monday the 21st, a resident of Barrio Los Hornos in the city of La Plata was shocked to see a flying object with green lights flying toward the Rio de la Plata. She was able to take a few photos of it with her Samsung J7 cellphone just as the eclipse reached its peak. At 02:30 hours, nearly 30 minutes, workers on duty at the Astilleros Rio Santiago dockyard witnessed the green object flying toward Monte Santiago. 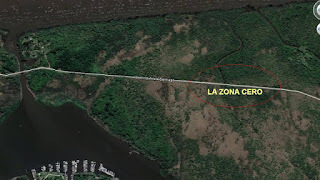 At 00:30 hours on Tuesday the 22nd, Angel T. and another person with him witnessed the south-to-north transit of a white-colored object from a house in Punta Lara. It caught their attention when they could hear no sound, nor their ability to see the characteristic navigation lights. 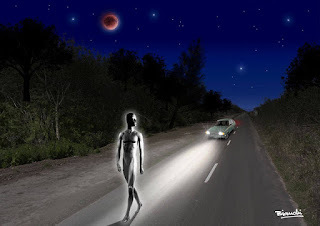 At 23:30 hours that Tuesday the 22nd, the second encounter with the humanoid took place, involving a couple driving their car along the same road. Lucia López – Mónica Alzamendi- Patricia Gómez- Nelson Polanco – Miguel Peralta – Diego Sampedro – Raúl González – Luis Hernández and Luis Burgos.